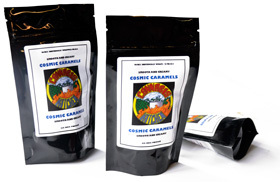 About six or seven weeks ago, I rediscovered a package of Cosmic Caramels tucked away in the refrigerator that had basically been sitting there for 2½ years. They worked just like they originally did; same effects, same strength, the whole bit. I’ve been slicing off pieces of the last caramel every week or so, as part of my general strain rotation. The other day, I did the same thing, but suddenly nothing happened (or at least, almost too little to measure). The reliable little chunk I had been lopping off the end, which brought me to a cheery [4.5], was now giving me a mediocre and somewhat melancholy [1.5]. I put it down to a glitch, but then thought about it and tried a piece twice as big, which gave out with a half-hearted . WTF? So today, I took a look at the last remaining chunk, which was comparatively huge. At the rate the effects seemed to be deteriorating, I thought it was safe to eat the whole thing, even though a piece this size would usually be good for taking my whole family to visit the moon with me. I did notice (but forgot to take a picture of, dammit), that the caramel showed signs of sugar recrystallization (hard spots) in places, but looked otherwise just fine. Well, I was right: I didn’t hallucinate or even get very high (maybe  or so). But I had the most peculiar fuzzy-headed feeling, and took a 2-hour nap. This is something I literally haven’t done in at least six months, and used to do all the time until 2011 (about six months after I started on MMJ). My working hypothesis at this point is that opening and using this last piece exposed it to enough air that it started breaking down, and the process is not gradual but tends to happen all at once. thanks for the great site. i make a little confection i like to call “fubar fudge” it’s canna-oil mixed with peanut butter and some powdered sugar, usually with some toasted coconut flakes mixed in, then topped with melted chocolate with some walnuts or pecans thrown on top. very easy to make. i pour it into a pyrex 13×9 lined with parchment paper and refrigerate until solid enough to cut into serving size. i put them in cellophane and freeze them. i swear they get more potent once frozen, but i’m probably just too high to tell. anyway, i’ve had some in the freezer for well over a year that i lost temporarily, and they were at least as potent as the fresher ones. btw i usually use ABV, or AVB, whichever you prefer, to make the canna-oil, with coconut oil. coconut oil works the best and tastes the best IMHO. Sounds like it should work quite admirably! Do you have any quantities or ratios you can share for anyone wanting to try it? Thanks so much, and nugs and hugs!